The B.C. boy is heading back west. In a mid-draft trade Tuesday night in Philadelphia, the Roughnecks acquired forward Jesse King and the 23rd-overall pick at the 2018 NLL Draft from the Georgia Swarm in exchange for forward and fellow southpaw Holden Cattoni and their seventh-overall pick. “If you want somebody good, you have to give up somebody good, that’s just the way it works,” said head coach Curt Malawsky. The Riggers’ new 6-foot-3, 200-lb. addition is ready to do anything it takes to contribute to his new club. “I’ve always portrayed my game as someone who wants to do whatever he can for his team,” King said Tuesday night. “Whether that’s going in the corner and picking up a loose ball, or putting a ball in the back of the net. 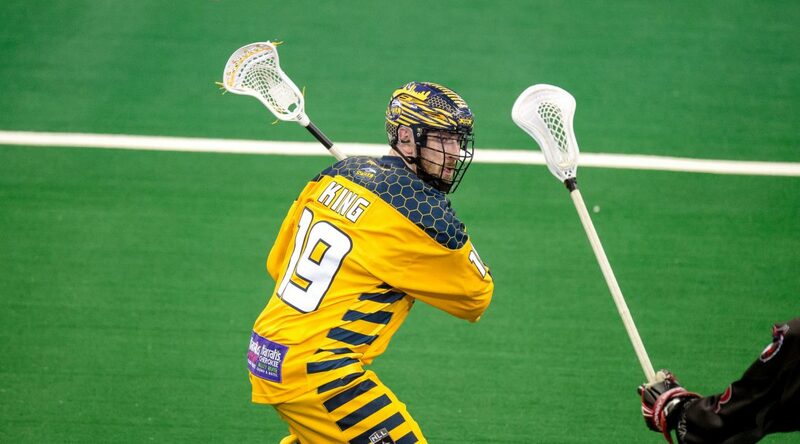 King tallied 28 goals and 41 assists last season for the Swarm, and the Riggers have high hopes he’ll bring the same grittiness and scoring ability to Calgary – along with a bit of balance. And after spending two seasons in the league’s East Division, the Victoria native is looking forward to spending some time a little closer to home in the Rough House. “I think that Calgary has one of the biggest fan bases that the NLL has seen,” King said. “I’m excited to be a little closer to home so my parents are able to come to a few more games. That certainly played a part in the deal. “Part of it is geography there’s no doubt,” Board explained. “Holden is living in Washington D.C. and that travel can wear guys down. I think both teams realize it’s a reality in the league. And being a Western guy, King’s already familiar with the Riggers’ lineup, including defender Greg Harnett.